Last night I spent a glamorous evening with super cool cats. Dear Doug pointed out that we had a cat theme going on - dinner at Bistro Chat Noir, Betty Buckley sang Memory from Cats and I wore my silver cat pin. Voila! 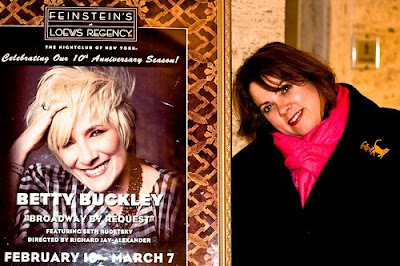 Of all the incredible things I get to do in New York City, going to Feinstein's is always one of my favorites, especially when Betty Buckley is there. Betty is doing a month of Broadway Request shows until March 7th. We got what we asked for last night - I got Love Song from Pippin (Seth wanted this one too since he got to sing on it) and Kari got Meadowlark. The evening began with a little of Seth's deconstruction then Betty opened with As If We Never Said Goodbye from Sunset Boulevard. Other requests granted, interspersed with stories of her career, included He Plays the Violin from 1776, Whoever You Are from Promises, Promises, When There's No One from Carrie, No One is Alone from Into the Woods, Send in the Clowns from A Little Night Music, and of course Memory from Cats. Go here to watch a BroadwayWorld clip about the show. You look so lovely! Glad you had a great time. Bob, While I tried my best to take your place, I believe Sarah and Kari were wishing you were there. Aww! That's so sweet, SOB! I loved Kari's voicemail she left around 1am for me - it's an instant classic. You look so pretty!! I'm glad ya'll had a great time.